NISSWA—Texas native Collin Thames always dreamed of moving away from his home state, and a Nisswa company and Brainerd organization helped make that dream come true last January. 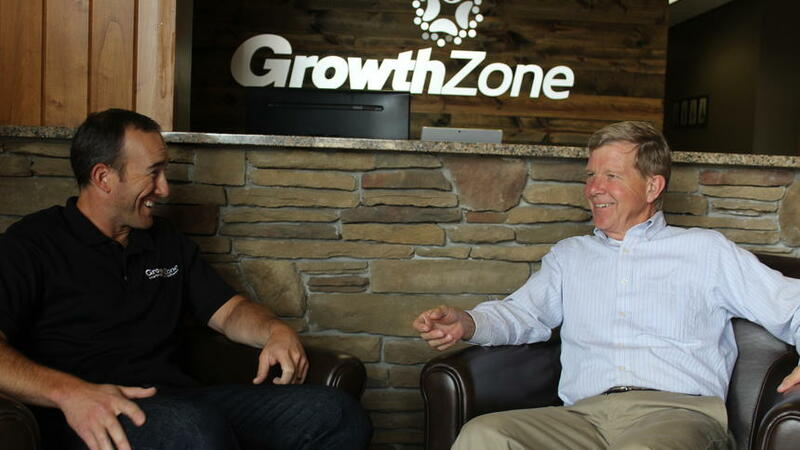 That’s when Thames made the move more than 1,100 miles north to work for GrowthZone, a company based in Nisswa that provides management software and services for member-based organizations worldwide. He had help from the Brainerd Lakes Area Economic Development Corp.
“Ever since I was little I wanted to live out of state, be a bit more adventurous than the rest of my family,” said Thames, 26, who grew up in various parts of Texas and most recently lived in Dallas. 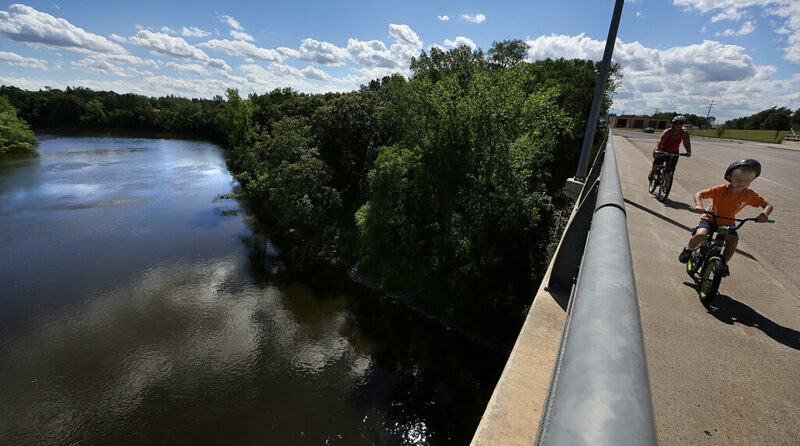 Desiring a better career path and a smaller community, Thames decided to look for a job out of Texas, focusing on the Brainerd lakes area. His girlfriend, Aryn Kriesel, had grown up in Minnesota, and he’d visited her parents’ home in Lake Shore a couple of times. While there were plenty of job opportunities in the Twin Cities area, Thames didn’t find a lot of offerings in his field in the lakes area. Then two things happened nearly simultaneously. Thames had contacted Mike Bjerkness with BLAEDC, and both Bjerkness and Kriesel discovered a potential job for Thames in quality assurance with GrowthZone, located in the Northland Center in Nisswa. “He was a big influence in getting me up here and getting a good job,” Thames said of Bjerkness, noting he helped Thames find an apartment and had other helpful tips. Moving to the lakes area from Texas in mid-January wasn’t too difficult, Thames said, noting he’d missed the previous week’s bitter cold snap. The lakes area is about the same size as his hometown in Texas, and neither he nor Kriesel were fans of large metropolitan areas or having a 10-minute drive take 35 minutes. However, Thames said he loves snow and prefers cold weather. And he quickly settled in at GrowthZone. Thames enjoys his drive to work too. “Until I came to live here I had never seen a natural lake. They’re all man-made in Texas. I find them gorgeous; they’re blue,” he said, noting he liked seeing the ice-covered lakes melt on his commute to work. “Work’s been great. It’s an amazing company with great leadership and co-workers,” he said of GrowthZone. Robin Eddy, director of software delivery and quality at GrowthZone, acknowledged BLAEDC’s help in bringing Thames to the company. The organization brings families to the area by helping spouses find jobs and helping parents find the right school district. “It’s the whole package. It’s not just an employment opportunity,” she said as she was preparing a job offer for a potential employee in Wisconsin. BLAEDC hired Mike Bjerkness as workforce director last November to design the recruitment program that has helped GrowthZone and other Brainerd lakes area companies. Bjerkness said BLAEDC had been hearing from IT companies in particular that were having issues recruiting high-level employees to the lakes area market. “It was a struggle. We don’t have a four-year institution in Brainerd to bring these people,” Bjerkness said. His goal was to get five people hired in his first year. He has completed six successful recruitments so far, and had just made another offer for GrowthZone to the potential employee from Wisconsin. 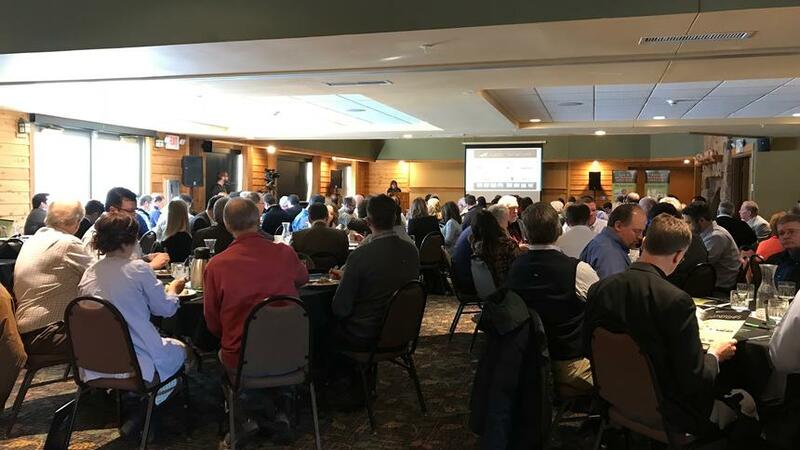 Lakes area companies Ascensus, CTC, GrowthZone and Syvantis Technologies, along with a grant from the Blandin Foundation, supported BLAEDC in hiring Bjerkness to build a recruitment program. The program’s approach includes marketing the lakes area and showcasing what it offers for potential businesses to locate here, and recruiting executive level employees for existing businesses. Bjerkness doesn’t just bring a new employee to town and tell them congratulations and good luck. He takes the extra steps to help the new recruits get settled here, helping them find housing, a financial institution, insurance agent, broadband internet provider and more. That connection to the community helps businesses in the long run. “We feel good that we’re helping them expand and grow and stay in the Brainerd lakes area,” Bjerkness said of those businesses. Bjerkness is currently working to bring employees to GrowthZone and Syvantis Technologies in Baxter. He’s also helped CTC and the new Kubota dealership – Quality Equipment – that was built recently north of Brainerd on Highway 371. He said BLAEDC is paving the way with its recruitment program. To his knowledge, Bjerkness said, no other economic development corporation does actual recruiting. GrowthZone also reaches out to potential future employees by participating in area school districts’ career days. “We help students with resumes and interviewing, and particularly with students interested in the IT field,” Eddy said, noting GrowthZone will hire high school and college students as interns in the summer. GrowthZone originally was called MicroNet, which started in 1996 as an information services company in the Twin Cities that helped small businesses with computer issues, said Scott Juranek, company CEO since 2008. Doug Hennum started the company, which moved to Brainerd in the late 1990s. Juranek said Lisa Paxton, then CEO of the Brainerd Lakes Chamber, wanted a better way to manage chamber member data and tie it into the website. That initial product, released in 2000, was ChamberMaster. Most chambers of commerce don’t have IT staff members so they were looking for tools to help with day-to-day business, Juranek said. ChamberMaster does just that. “We have a whole suite of software that helps a chamber thrive,” he said. 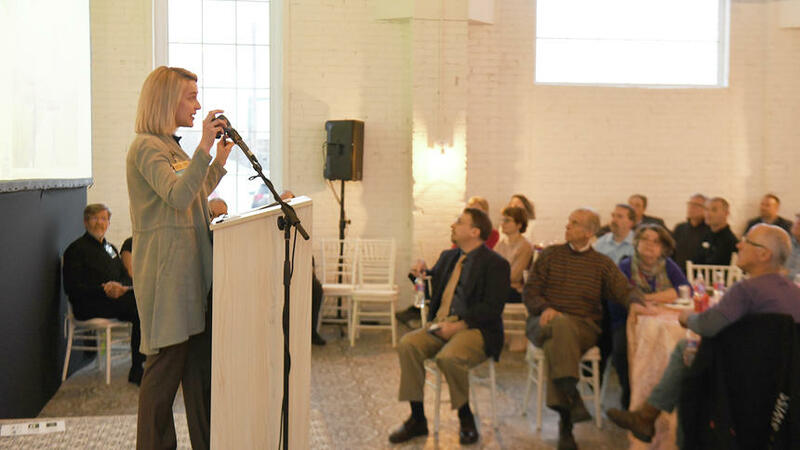 In 2011, the company moved to Nisswa, and in 2012 it released MemberZone for trade and industry associations. Three years ago, the business started the next generation product that reflects software for any type of association. BLAEDC was GrowthZone’s first customer. Ironically, Paxton is also a customer with her business, Ultra Paws, and is helping shape the new GrowthZone software, Juranek said. While chambers of commerce are GrowthZone’s largest market, home builder associations make up the second biggest market. GrowthZone has over 2,800 total customers; 2,400 of those are chambers, over 100 are home builder associations and the remaining are various other entities. The company’s most recent growth has come from those non-chamber associations, and that’s why the company changed its name from MicroNet to GrowthZone—because the product evolved and now has a broader focus than just chambers of commerce. “We’re definitely growing here,” Juranek said, noting most of the company’s growth has been in the past four to five years. The company has about 90 employees, including about a dozen in other states. Positions include software developers, sales people, customer success, marketing, human resources, software quality assurance, web design and product management. Juranek projects adding another 10-15 employees per year, and he said they’ll need more space by the end of this year or beginning of next year. Juranek likened GrowthZone’s products to Netflix, where people pay monthly, log on and find new content. GrowthZone has chamber members from every state and Canadian province, as well as in the United Kingdom and Australia. The company has over 2,800 customers. Juranek said a fun goal is to one day reach 10,000 customers, since Minnesota is the Land of 10,000 Lakes. • Number of employees: 90. • Interesting fact: In 2006, the first son of Chris Mead, a vice president at the Association of Chamber of Commerce Executives, was named ChamberMaster Mead for two weeks. This was part of a fundraiser and was when selling naming rights was a fun way to raise money and awareness. This was featured in the Wall Street Journal.